James E. Wharton (December 2, 1894 - August 12, 1944) General Wharton is the seventh General to be killed in action since Pearl Harbor during World War II. An officer of the Regular Army since 1917, the General was Chief of the Officers Branch in the Personnel Division G-1 of the War Department's General Staff when the United States entered the war. 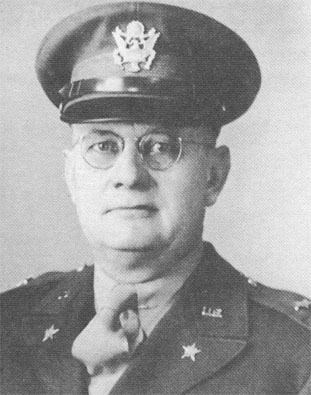 In March 1942, when he was promoted to the temporary rank of Brigadier General, he was made Director of Military Personnel Division Headquarters Services of Supply for which he was awarded the Legion of Merit. General Wharton was born in Elk, New Mexico, December 2, 1894. He was commissioned a Second Lieutenant of Infantry on August 15, 1917. He went to the Philippine in 1921. He returned to the United States two years later and was stationed with the Third Infantry at Fort Snelling, Minnesota. He was graduated from the Infantry School at Fort Benning, Georgia; the Command and General Staff School at Fort Leavenworth, Kansas; the Army War College and the Army Industrial School in Washington, D.C. He became the 28th Infantry Division commander after Major General Lloyd D. Brown. On August 13, he was mortally wounded by a sniper visiting the front lines. He was succeeded by Major General Norman D. Cota, who had just returned to active duty after being wounded earlier in the campaign. While most official records has him being killed in action on the 13th August 1944, his tombstone in Arlington National Cemetery has it listed as the 12th August 1944. He is buried at Section 34, Site 1198.